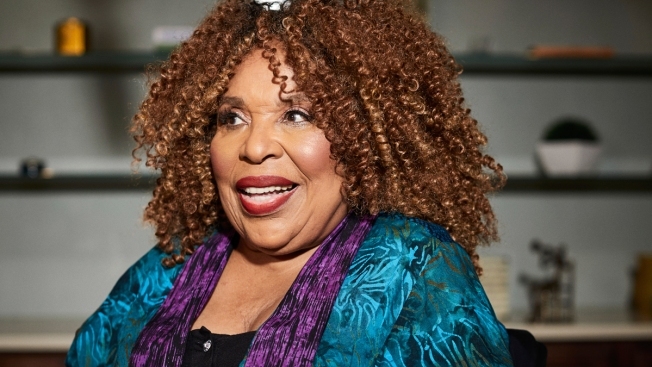 In this Oct. 10, 2018 photo, singer Roberta Flack poses for a portrait in New York. The 81-year-old music legend will be honored Saturday, Oct. 13, 2018, with a lifetime achievement award by the Jazz Foundation of America. Once a week, Roberta Flack gives a musical performance for an exclusive group. "I know what it is to go over the same songs over and over again, and to try to make them perfect. It's interesting and it's hard and it's difficult at the same time," Flack said in an exclusive interview with The Associated Press this week. "You have to stay on top of things." "I am very excited about the event, to sing, and to perform. I'm just hoping that I can find the right song," said Flack, whose long list of hits include "The First Time Ever I Saw Your Face," ''Killing Me Softly with His Song" and "Feel Like Makin' Love." The Jazz Foundation of America provides assistance of all types to musicians who have suffered setbacks, whether they're medical, financial or both. It was set to give Flack its lifetime achievement award at the Apollo Theater at a concert featuring Cassandra Wilson, Alabama Shakes lead singer Brittany Howard, Nona Hendryx and more. But Flack collapsed backstage and was rushed to the hospital. The concert went on without her. "I'm very excited that they want to give me an award, and I'm excited about the cause of the award, and the whole thing. I'm hyped about it," Flack said. When asked if she'd sing one of her old hits, she quickly retorted: "There's no such thing as an old hit," preferring the term "classic" instead. "I could sing any number of songs that I've recorded through the years, easily, I could sing them, but I'm going to pick those songs that move me," Flack said. "Now that's hard to do. To be moved, to be moved constantly by your own songs. You need it to be in tune with them, and I don't mean in tune musically, but I mean in tune with the lyrics of the songs, with the words of the songs, and with the meaning. You need to be in tune with all of that, and that takes a little bit of doing." Her work with the musical director from the Jazz Foundation is part of that keeping in tune. Flack's connection to the group started years ago, when they enlisted her to perform at a benefit for the late folk great Odetta, who had fallen on hard times. "Ten years ago, she came out to help us when we were helping Odetta, who was one of her idols," said Wendy Oxenhorn, the foundation's executive director. "Roberta has been all of our idols. And now, since her stroke, we've been able to give back and help her, which is so beautiful." "We didn't want her to miss this because she is loved around the world, and she's kept so many of us going through our hard times with her music, and she's been such an icon and pioneer in her genre," she said. "We want her to know how loved she is." "I thank you from the bottom of my heart," the singer said. "It seems like we get a lot of musicians who don't need help, who do it themselves or do it on their own, and that's not true, that's not true, they need a lot of help. I'm happy to help." As for Saturday's performance, Flack said she would likely be excited and nervous, and "all those good things that happen before you go on stage." She modestly dismissed expectations when a reporter suggested the night would be amazing: "It's going to be real funky and nice. We're going to make it a party."